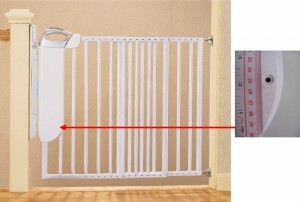 The U.S. Consumer Product Safety Commission, in cooperation with The Dorel Juvenile Group, today announced a voluntary recall of about 31,500 (100,000 units were previously recalled in February 2009)Safety 1st SmartLight Stair Gates because the hinges that hold the stair gate in place can break, posing a fall hazard to children if the gate is placed at the top of the stairs. The recall involves the Safety 1st SmartLight Stair Gate with model number 42111, which is printed on a sticker under the handle panel. The gates, which were manufactured before December 20, 2008, are white metal with a gray handle and a motion sensor nightlight that illuminates on approach. The manufacture date is located below the gate’s handle as a date wheel imprinted in the plastic; an arrow indicates the month, and the year is stamped inside the circle. The manufacture date is also printed on a sticker inside the battery door. Consumers should stop using the recalled gate and contact the company to obtain a free repair kit. Consumers can call Dorel Juvenile Group toll-free at (866) 690-2540 Monday through Friday from 8 a.m. to 4:30 p.m. ET; complete an online order form on the Dorel Juvenile Group Web site at www.djgusa.com/safety_notice/ to obtain their free repair kit; email the company at Smartlightgate@djgusa.com, or send a fax to (800) 207-8182. Consumers should not return the stair gates to retail stores.